The Chulu West Peak Climbing is an extra ordinary option for the adventure seekers. The Chulu West Peak is located at the elevation of 6419 m. The Peak offers the magnificent views of Dhaulagiri, Nilgiri, Annapurna and the other snow capped peaks. The Chulu West Peak was first climbed in 1952 by the Japanese Expedition. The Chulu West Peak Climbing is one of the challenging peaks climbing in Nepal. It provides a kind of thrilling experience. However, it is not too much technical, so anyone can join it and it is mostly suitable for the amateur trekkers. Similarly, the trekking to Chulu West combines the Annapurna Circuit Trekking trail too. Basically, the Chulu West Peak Trekking starts from Chame after having the longer driving from Kathmandu. The trek begins along the paddy farm and the river ways. You go ahead through the forest area too by passing the hilly gorges, waterfalls and so on. Almost in all the way to Chulu West Mountain, you enjoy the gorgeous views of Himalayan giants like Annapurna ranges, Dhaulagiri and the Chulu West itself. After having an acclimatization day, you climb to the Chulu West Peak along the snow covered trail. Finally, you become able to summit it and enjoy the surrounding sceneries after reaching on top of Chulu West Peak. It is like a paradise which offers the awestruck views of Dhaulagiri, Nilgiri, Annapurna and the other towering peaks. After spending some time over there, you descend down. Then you join the Annpurna Circuit Trekking route. You cross the Thorong La Pass too, which is considered as the highest point of the Annapurna trekking. The Muktinath Temple is also remarkable. It is the popular pilgrimage site for both Hindus and the Buddhist people. 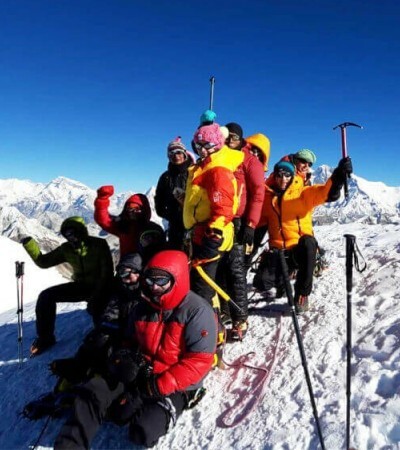 Rising Adventure has been conducting the adventurous Peak Climbing Packages in Nepal. If anyone has the strong intention for the Chulu West Peak Climbing, please contact us. We help you in customizing it. Day 03 :Drive to Besisahar (760 m) and trek to Khudi (790 m). Overnight in Khudi. Day 04 :Trek to Sirung (1864 m). Overnight in Sirung. Day 05 :Trek to Chamje (1430 m). Overnight in Chamje. Day 06 :Trek to Dharapani (1900 m). Overnight in Dharapani. Day 07 :Trek to Chame (2660 m). Overnight in Chame. Day 08 :Trek to Pisang (3200 m). Overnight in Pisang. Day 09 :Trek to Upper Manang (3540 m). Overnight in Manang. Day 10 :Rest Day at Manang (3540 m). Overnight in Manang. Day 11 :Trek to Leather (4200 m). Overnight in Leather. Day 12 :Trek to Chulu West Peak Base Camp (4900 m). Overnight in Base Camp. Day 13 :Acclimatization Day at Base Camp (4900 m). Overnight in Base Camp. Day 14 :Trek to the Chulu West Peak High Camp I (5100 m). Overnight in High Camp II. Day 15 :Trek to the Chulu West Peak High Camp II (5530 m). Overnight in Camp II. Day 16 :Climbing to the Chulu West Peak (6419 m) and come down to the High Camp I (5100 m). Overnight in Camp I. Day 17 :Trek back to Leather (4200 m). Overnight in Leather. Day 18 :Trek to Thorong Phedi (4450 m). Overnight in Thorong Phedi. Day 19 :Trek to Muktinath (3760 m) by crossing the Thorong La Pass (5416 m) and to Jomson (2715 m). Overnight in Jomsom. Day 20 :Early morning flight to Pokhara (800 m) and Pokhara Sightseeing. Overnight in Pokhara. Day 21 :Drive back to Kathmandu (1350 m). Overnight in Kathmandu.